Hoodies are a staple for any comfort loving woman out there. They are amazing for so many different reasons, they will keep you warm, they are cozy, and if you need to unexpectedly cover your head if it starts to rain or snow the hood is right there. If you get one that is a little big and has a soft, warm fabric you will never wear anything more comfortable on a cold winter’s day. My preference is for the zip hoodies, but I’ve included a few pull-over styles if that is your thing. They are kind of expensive, but a lot of women love the Lululemon Scuba styles. Right now they are on version V of this particular design, and they are still going strong. The latest fit is very flattering for most body types, and it now comes in 15 different colors. The fabric is a breathable cotton fleece that somehow manages to let you cool down after a workout, but will still keep you warm on cold days. The Scuba is versatile, great for traveling, and flattering for most body types. Owners of this hoodie love the ribbing at the wrists, the thumb holes, and the shape of the hood. If you are looking for hoodie from a socially responsible company, you can try the Eco-Fleece from Alternative Apparel. The fabric is made in the U.S, and it contains organic and recycled materials. The Eco-Fleece is known for being super soft and long-lasting. This particular style is produced in a Worldwide Responsible Accredited Production (WRAP) accredited factory, which means that they respect the rights and safety of the workers who are making the garments. 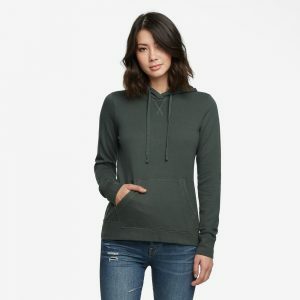 H & M Hoodies are one of the best budget options if you are looking for a decent quality, comfy women’s designs. They are usually offered in many pretty good colors, with the fabric being a mix of 58% cotton, 42% polyester. The weight of the material is a little thinner than other options out there, so they are a great all-rounder. They will keep you warm indoors and fit well under your coat to add an extra layer of warmth. They are pretty basic with no bells and whistles, just side pockets, a zip at the front and ribbing at the cuffs and hem. Everlane is one of my favorite go-to stores for comfortable clothing. Their Classic French Terry Hoodie is a loose fit but has a nice cut at the waist, so you don’t feel like it’s too bulky for some reason. It doesn’t have pockets which help add to the modern, almost stylish look to the shirt. This design comes in black, bone or gray, and is made of a soft 100% cotton. American Giant has a few great options for comfortable hoodies. A versatile option is their Essential pullover that is a mid-weight sweatshirt, which means that it isn’t too thin or too thick to get you overheated. Their women’s styles are also really flattering while still being cozy. American Giant seem to put a lot of thought into their different fabric blends; here is a breakdown of the qualities of the different fabrics that they use. Most of the styles are known for being soft but durable and able to stand up to a lot of wear. They are made in the USA, the company offers military discounts, and they have an excellent return policy. American Apparel was recently bought by Gildan, a Canadian activewear company, the stores are closing, but the website will probably live on. Hopefully the styles and quality of the clothes will remain the same because they are great hoodies. They last forever if cared for properly, and they are super cozy and comfortable. With Gildan purchasing the company, many of their products will now be made outside of the U.S for the first time, some will still be made in the U.S, but if this is a concern you should double-check any designs you are considering purchasing. If you are a fan of the trendy Zella leggings, you may also want to check out their excellent hoodies. They are super soft and come in a number of heathered color options. They are a relatively slim fit, so they are flattering but if you want something loose and baggy you may want to size up if you are interested in this style. What makes a good fit for a women’s sweatshirt is pretty subjective. Some women like their hoodies to be oversized and loose-fitting for the ultimate in comfort, while others prefer a more fitted waist for a more flattering look. If you are going for pure relaxation and don’t mind a little bit of a boxy look, you may want to check out some of the men’s smaller sizing. Men’s styles are also a bit longer than the women’s fashions for those who prefer more coverage in the hip area. 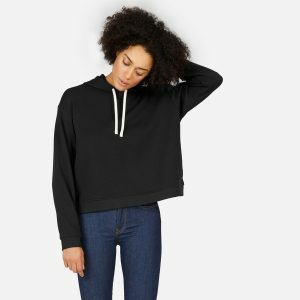 If that is not your thing, most women’s designs are tapered at the waist and have a little more space in the chest area if you want the sweatshirt to fit closer to the body. Hoodies are made out of lots of different types of material and material blends. For warmth, durability, and comfort you may want to look for a cotton or polyester fleece blend. Polyester fleece may feel a little softer than cotton fleece when it is first worn, but over time it tends to lose some of that softness. Polyester fleece is warmer than cotton fleece because it doesn’t breathe as well, so your body retains the heat. Cotton fleece will soften up over time and is more breathable, making it a little more versatile for different weather. 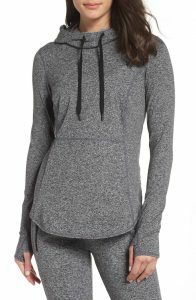 Out of our list, The Lululemon style is cotton fleece, while the H&M and Roots are polyester fleece. The others have slightly different blends. For warmth, you will want to look for sweatshirts that have a heavy fleece or a polyester fleece to help retain heat. Polyester fleece can sometimes be hard to wear indoors because it can get hot. For colder weather, heavyweight fleece styles are available to help maintain warmth. The thickness of the material is also worth giving a little bit of thought to when shopping for a perfect sweatshirt. Hoodies usually come in either a thin, mid-weight or a heavyweight thickness. The type you select will depend heavily on the kind of weather you will be wearing the hoodie in. If you like to layer, you should look for a lightweight or mid-weight. Heavyweights are sometimes not the best for layering as they are too bulky and get too hot. Obviously, for warmer temperatures, you will be looking for a thinner fabric. It kills me to pay for expensive styles, but I pretty much wear them every day in the winter so the cost ends up being worth it Hoodies come at almost all price points. What you are usually paying for with a hoodie is the fabric, where it is made (expect to pay more if it is made in the USA) and any branding or logos can also increase the price. You can get simple plains styles for as low as $15 from some stores and online. To me a sweatshirt without pockets is kind of useless; you may as well just wear a sweater. Hoodie pockets are fairly standard across the board. Pull-overs usually have one big pocket at the front or more rarely two at the side. Zippered styles will have almost always have two pockets. The quality can vary quite a bit between different brands; some other high quality, but still reasonably well-priced brands to look out for are Hanes, Jockey, Champion, and Gildan. Your two basic styles are a pullover and a zipper style. Both have their benefits and drawbacks. The hood almost always has a drawstring closure, and pockets are at the front of the garment or slightly to the sides. One of the best things about hoodies is that they are very low maintenance. To clean them all you need to do is throw them in the washer and dry them in a dryer, they don’t even need ironing. It can’t get easier than that. If you are someone who lives in your sweatshirts, let me know in the comments below if you have any recommendations.